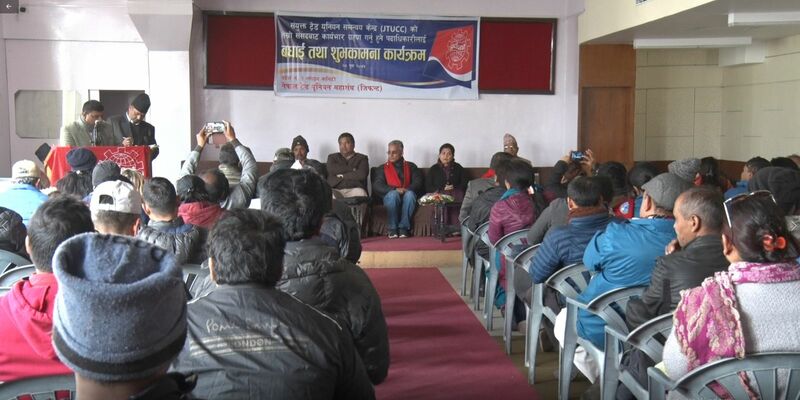 Kathmandu, GEFONT Province No 3 has felicitated to the newly elected leadership of the Joint Trade Union Co-ordination Centre by organizing a program on 12 January 2019 in Kathmandu. President of the JTUCC Cde. Binod Shrestha, Secretary General Mr. Paltan Thakur, Woman Coordinator Ms. Sudha Dahal , felicitated by chief guest, Cde. Bishnu Rimal the Chief advisor to the prime minister & founder president of JTUCC. 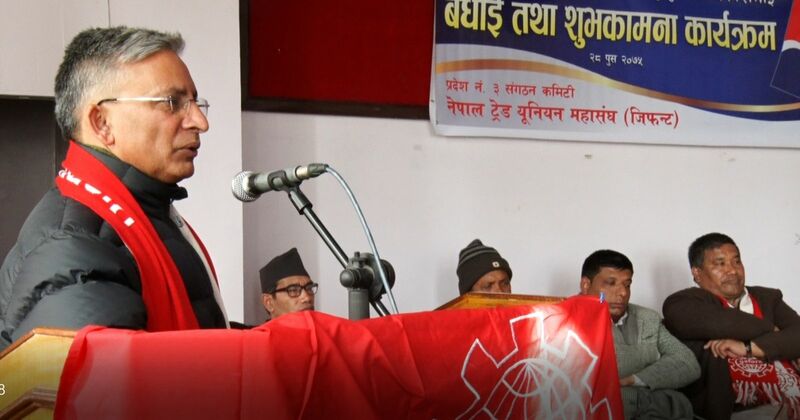 Speaking in the program Chief Guest GEFONT patron & Chief advisor to the Prime Minister Cde, Bishnu Rimal Said” the social security program, which is fully implemented from August, will make significant changes in the workers life.” And the role of the trade unions also changed. He further said “trade union also have representation in the social security board; Efforts should be taken to effectively implement the existing laws and programs. Based on the effective implementation of social security programs, there would be a different identity of Nepal in the world, He further added. GEFONT Patron Cde. Rimal further Said “We have been dreamed for transformation & now we are in the position to fulfill that, Trade Unions have responsibility to make it possible most of the issues which raised by Trade Union has been fulfilled.” Speaking about JTUCC Cde. Rimal said that in the context of the creating common understanding of all Trade Unions on labour related issue trade unions have succeeded to form the common forum. It was consider as an impossible to implement social security before 10 years back, but now it has been implemented. He further suggested that the JTUCC should decide the way forward by discussing the work done during the decade, the achievements, the work that couldn’t be done & the future challenges . Speaking on the occasion, GEFONT president & JTUCC newly elected president Cde. 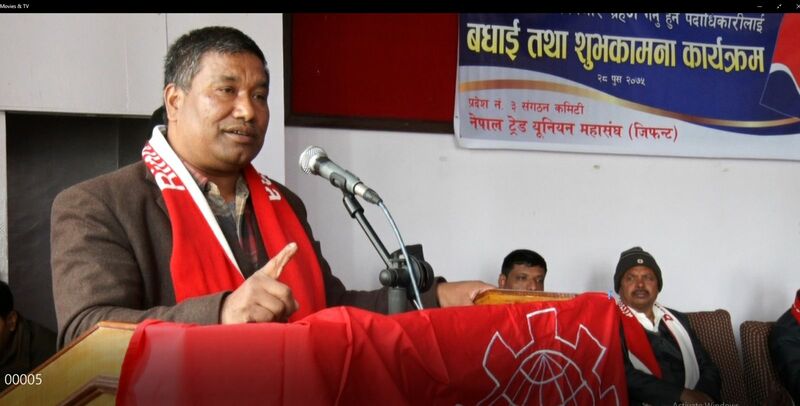 Binod Shrestha said “divided trade union movement can’t achieve the workers’ rights, to have united voice of all the trade unions, the common forum of Trade Unions the JTUCC has formed. 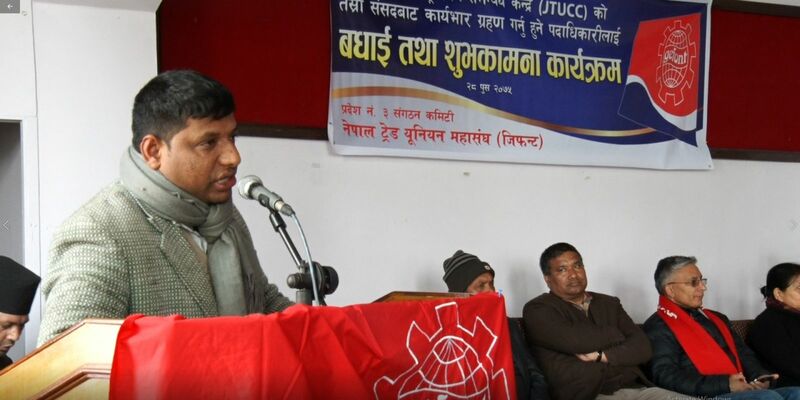 If Trade Unions of Nepal didn’t unite through JTUCC, present achievement wouldn’t be possible. The unity and cooperation of Trade Unions should be stronger for further effective implementation of Labor Act, Contributory Social Security Act. He also urged to the unions to work more closely & actively to organize huge number workforce. 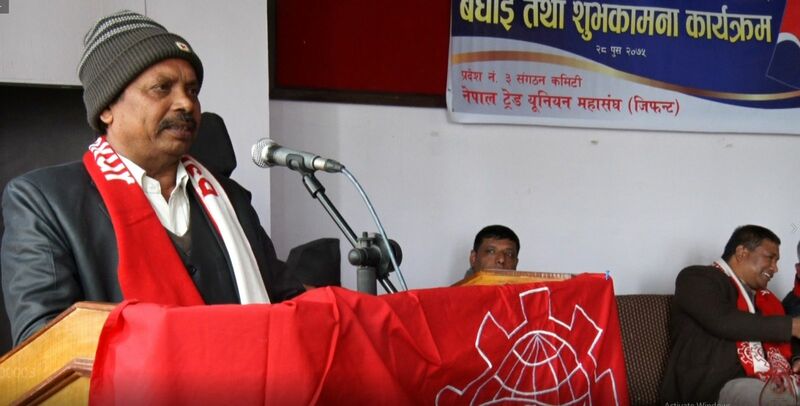 In Nepal only 12 % workers are organized in trade unions. If we could organize remaining 88% than trade unions would have good influence in political party. However, According to the political ideology trade unions are working separately but on the issue of the workers all unions worked jointly to solve workers problems and that will be strength of the JTUCC in future also.While taking up 10 percent representations of workers in government body, trade unions also should be politically aware and active on their demand. Trade unions should increase the involvement in political parties. Speaking on the occasion, JTUCC General Secretary Paltna Thakur said that he was pleased to have information about GEFONT work. He also appreciated GEFONT for organizing in formal & informal both sectors. 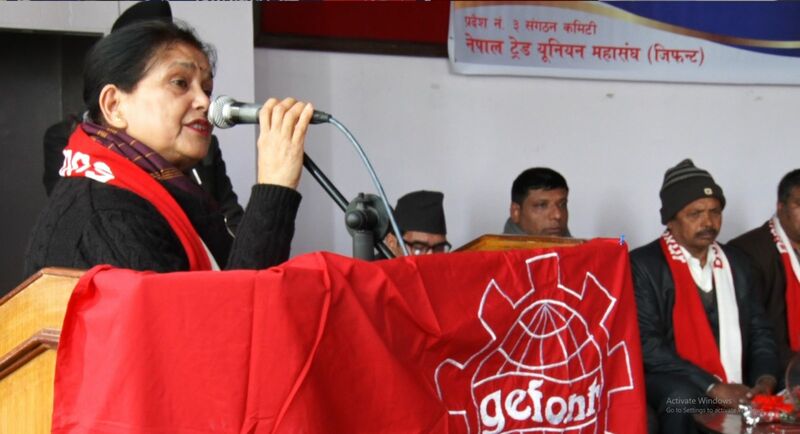 JTUCC Women Committee Coordinator Ms. Sudha Dhaal thanked to the GEFONT for the new tradition to felicitate the new leadership. She has also heighted the achievements with the cooperation between GEFONT & NTUC before forming the JTUCC. Speaking in the program, GEFONT Vice President & Province No 3 Incharge Cde. 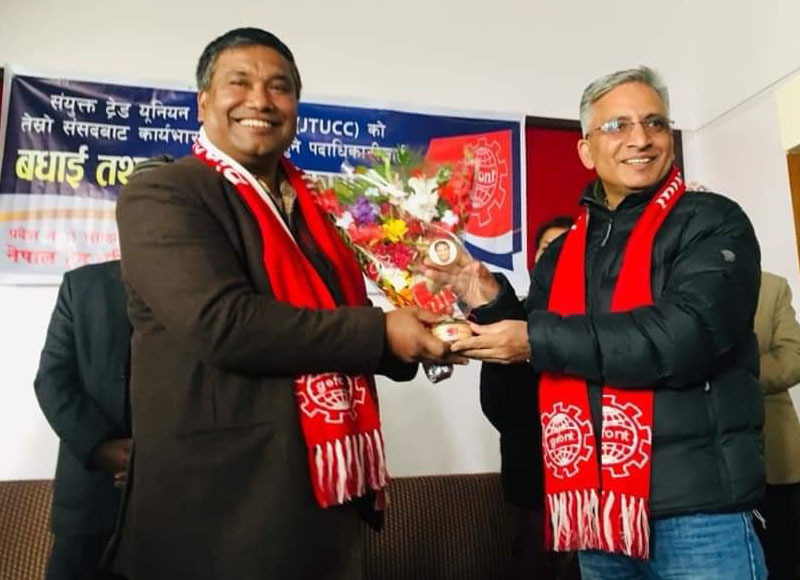 Jitendra Shrestha has congratulated & extended best wishes for successful tenure to the newly elected JTUCC leadership. He also expresses hope that JTUCC will work for the effective implementation of the Contributory Social Security Act & labour Act. 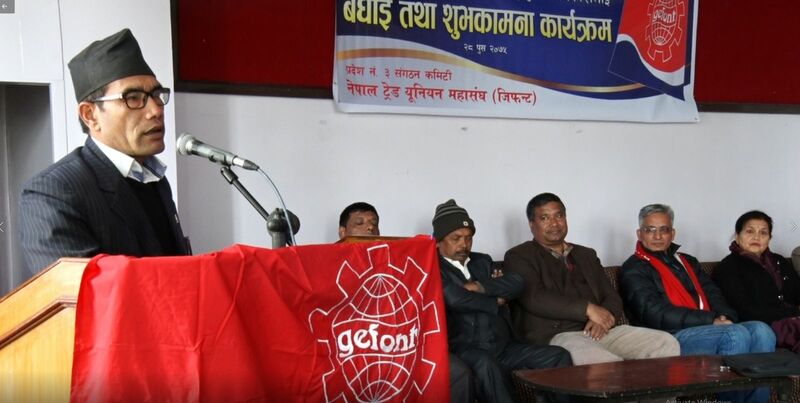 Since year 2000, coordination between the largest trade unions of Nepal GEFONT & NTUC had succeeded to formed common forum for the trade unions & the joint trade union coordination centre (JTUCC). Through the JTUCC Trade unions could have important achievement for the welfare of the workers. Even though, according to the law all workers are equal but the implementation part is still challenging.” he also said that there are still lots of the challenges to corporate Agriculture sectors workers, Health Volutes in Social Security scheme. Women Committee president of Province Cde. Indira Achaya also addressed the program. There were more than 200 participants participated in the program.